* Ampersands Artist Panel, is an acrylic gesso surface on MDF panel for oils and acrylics. 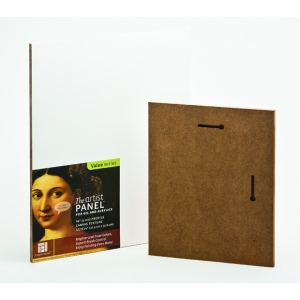 * Economically priced for students, leisure and budget minded painters, this surface has a wonderful canvas-like texture that gives artists the advantages of a panel with the feel of a fine canvas. * Choose from three profiles: 1 1/2" Gallery Profile, 3/4"Traditional Profile, and a 3/8" flat panel with a hanging cut for quick & easy hanging. * With hanging cut. This great flat panel has the added feature of a hanging cut on the back side of the panel, making it a convenient and ready-to-hang painting surface.